Age: 3-10 years. Your child dreams of being a super-hero who can fly as fast as lightning? Imagine if Dad had superpower strength and could carry a car on his back. And Mom had X-ray vision and could see through solid walls. In this action packed personalised story filled with humour, your little hero lives a truly extra-ordinary adventure. A book enjoyed by the entire family. Book description : 30 pages personalised story book, size: 20 cm x 20 cm, thick high quality paper, using professional digital printing, and a durable laminated cover. Age: 3-10 years. Your child dreams of being a superhero who can fly as fast as lightning? Imagine if Dad had superpower strength and could carry a car on his back! What would happen if Mum had X-ray vision and could see through solid walls? In this action-packed personalised story filled with humour, your little hero lives a truly extraordinary adventure. When chaos strikes, it is your family that comes to the rescue in this special book starring Mum, Dad and child. Hand painted acrylics by our professional artists are the finishing touch that turns a tale into a lively quest. Personalisation : The child appears 10 times, his/her name and family name 6 times. Mom and Dad appear 5 times in the book. Your personalised message to the child is written at the beginning of the personalised book. 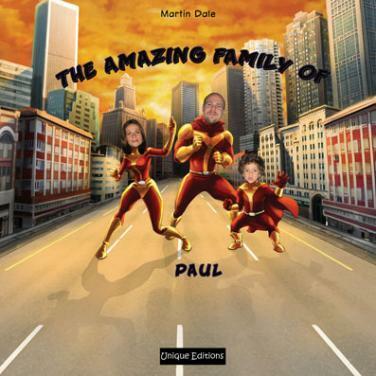 Make your own story book starring your Amazing Family ! Older children need fantasy to liven up their reading times as they learn to love books, so this personalised tale adds entertainment to reading, helping your child to follow the way words look on the page as he learns to read. Many children refuse to cast even a timid eye over the first sentences of a story book. The pages of their superman comics, on the other hand, are dog-eared and the buttons of their smart phones have shed their numbers. Stories about fairies, goblins and bunnies are seen as dull and too full of words. So many parents are trawling book shops in search of that one piece of fiction that will capture the lively imaginations inside those little bodies. Often imagination needs a little kick to wake it up. After it's woken it becomes ravenous. It gobbles up storybooks wherever it finds them—at least that's what parents hope will happen when they find that lost, magical mystery book. Personalised children's stories are often the only nudge children need to make them hunger for more. Here, a superhero comes to the rescue in the form of personalised children's books. New developments in book printing have made it possible for commercial publishers to set a child's photograph and name to a professionally illustrated and written book. Now the delight of customised fiction is available to every child and it's putting books back on the priority lists of kids.